Contextualization in the New Testament: Patterns for Theology and Mission ReviewAs the emergent village dialogs to frame new paradigms, more orthodox churches and movements struggle to maintain their theological integrity while contextualizing their message. Dean Flemming, with teaching experience in southeast Asia and western Europe, contributes usefully to this discussion. Flemming, whose orientation is Wesleyan-Arminian, provides a careful and thorough study of the contextual ministry of New Testament authors, whom Flemming contends were highly aware of the cultural settings they addressed, framing their messages accordingly. Moving with an articulate grace through many Pauline passages, Flemming devotes the core of his book to Paul's efforts to contextualize both the transitional and cultural aspects of Christ's life --- e.g. his Jewish birth and heritage --- as well as the universal and transcultural realities of Christ's atoning death and subsequent resurrection. Flemming proposes that, among its other relevant characteristics, authentic contextualization is compellingly incarnational. Rich in theological and Biblical insight, this volume approaches an essentially missiological task from the broader framework of cross-cultural apologetics, informed by a scholar's passion for first-century Christian thought and experience. Greatly useful for those doing missiology today, this volume is also a first-rank contemporary study of key New Testament issues. 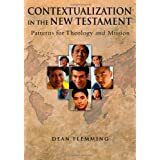 Want to learn more information about Contextualization in the New Testament: Patterns for Theology and Mission?